Crimplene. Just mention the word and faces grimace. Dismissed as cheap and nasty, this stiff, non-breathable, synthetic material has rarely claimed its rightful place in fashion exhibitions. It represents one of the many missing chapters of everyday dress. But one cannot overlook what this fabric meant to working class women and girls in the UK in the sixties (and later still). Often In vivid colours and patterns, easy to cut and construct (it did not fray, so often edges were not overlocked), machine washable (it drip-dries very quickly), in no need of ironing - and yes- cheap, crimplene made new fashions, like the miniskirt that held an a-line shape, widely accessible. Indeed, if it weren't for crimplene, would the reproduction of Mary Quant's mini have risen in popularity so widely, so quickly? Of all materials, crimplene was surely the great democratiser of 60's fashions. For Concetta Trotta (1928- 2012), who kept her 1964-'68 crimplene wardrobe meticulously stored in polythene bags until her death, crimplene symbolised a new beginning, a respectable life she made for herself. It demonstrated a fashionable sensibility that facilitated her career progression in Brighton's retail sector, despite significant personal challenges. The everydayness of her wardrobe at the time- her dresses are not overtly ostentatious- concealed her deep personal troubles with their ordinariness. Italian-born Concetta Trotta was married to her first British husband on the Naples Nato airbase in the last year of WWII. When fighting ceased, she flew back with him to the UK and settled in Rottingdean, where she gave birth to her first-born son. Sadly, by 1951, her philandering husband abandoned both herself and their son Reginald on Cranbourne Street in the centre of Brighton (then a slum area that was to be demolished in the late sixties, and where Churchill Square, the city’s premier shopping centre, now stands). Reginald and Concetta never saw him again. Concetta was homeless, jobless, a single mother, and what is more, had a thick Italian accent and no family in the country. Concetta Trotter found emergency accommodation at a nearby Jewish boarding house for single women. She soon began working for a local Jewish shoe maker, Mr Lyons, learning the retail trade that was to earn her income for the next twenty odd years. Progressing from Mr Lyon's shop, she found employment at Russell & Bromley’s, the most fashionable shoe retailer in Brighton at the time, and by the early sixties she had risen to the position of top saleswoman at the store. Having remarried in 1967, she later opened a laundrette with her new husband. "She very quickly met friends. Female friends. And so really she got into the life of a young woman at that time. And being very, you know, being fortunately very attractive and she always did have an awareness of how she looked… And her friends obviously helping her, too… You see what used to happen in those days, girls used to, because of the money situation, you know, they would interchange their clothes. And so they would share their clothes. So they would buy for themselves… They would think – aw, I wonder if, um… Nora could fit into this? …They thought outside just themselves. With really not a lot of money, but having a good eye for how things look, they could make each other look very fashionable and up-to-date." This idea of young, poor, working class women sharing rooms in a boarding house and buying crimplene dresses in popular designs with each other in mind, illustrates the central role the fabric played not only in wardrobes, but also, in people's lives. For these girls, this affordable synthetic material became a metaphor for community, the material culture of these working girl’s collective struggles and ambitions. Being fashionable was both an individual and group effort. Giles Lipovetsky states that: “Fashion is no longer an aesthetic embellishment, a decorative accessory to collective life, it is the key to the entire edifice.” It is possible to imagine that the key to life for Concetta was to appear respectable, pay all her own bills on a low income, participate in some social activities outside of work, and provide the best possible future for her son that she could, given the circumstances. Her choice of crimplene for dresses and slacks made complete sense. With a limited disposable income, a young child to care for on her own, and holding a position within the fashion industry, her purse needed to stretch to meet her personal ambitions. 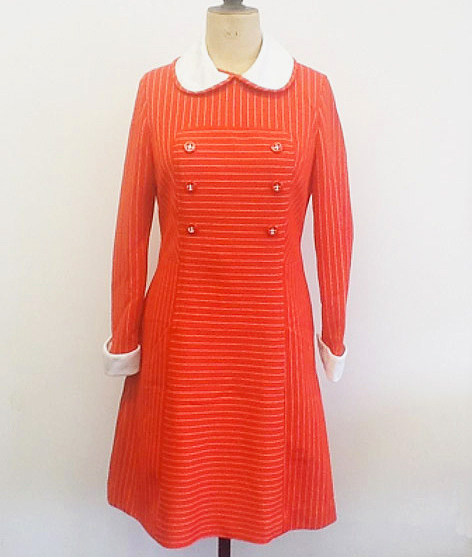 Her red and white pinstriped (not too short) mini, with its Peter Pan collar and double breasted button design was practical, affordable and hard wearing. But above all, it was up-to-date, in fashion and of the day. There was a reason she saved that little red mini for over forty years. Perhaps it was because it marked a pivotal point in her life between loss and new beginnings. And precisely because of Concetta Trotta's real-life story, and the countless others embedded in the millions of dresses manufactured in this material, there is a place for crimplene in the fashion museum, just as there was a place for it in so many women’s wardrobes throughout the UK in the 1960’s. 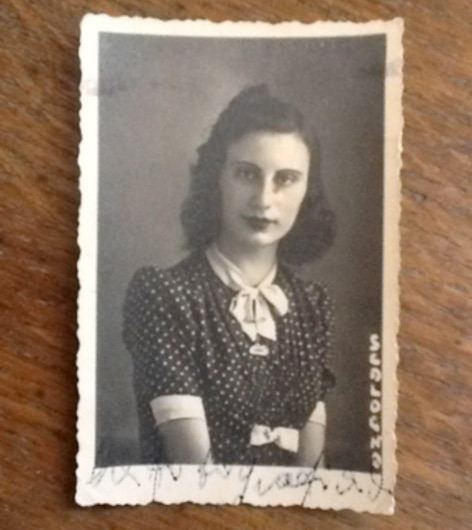 Concetta Trotta, around the year she was married (1942) according to her son, Reginald. Concetta Trotta's crimplene red and white pinstripe dress, c.1964.